lt’s incredible how a community can come together for a cause they support and show up for the people they love. Designer Olga Szwed was heartbroken when she first heard her friend’s Elena Scott and Masha Culver‘s children were struggling with severe illnesses. They were battling for their lives, and undergoing strong medical treatments. Elena’s son, Preston, is 6 years old and was diagnosed with Medulloblastoma (brain cancer) and Masha’s daughter was diagnosed with a rare disease that included 3 surgeries and a liver transplant at only one month old. Olga got her crew together, a.k.a her best friends in the fashion world, to organize and volunteer for a show that would raise money to support these two young children. Compassion with Fashion was a magical night. There were no empty seats, the room was packed with supporters ready to donate money to a worthy cause. Entertainment for the night included opera singer Faira Morozov, professional ballet dancers, a couple singing duets, and more. Performers captivated the attention of the audience and volunteered their talent and time. Mixed into the program were the most recent collections by local Seattle designers: Third & Loom, Victoria Postolit, Elita Couture, MXN Clothing, Justin Zachary, and La Belle Reve. The styles were impressive with cascading sheer mesh ruffles, suede fringe, and bright accents. That night, $30,000 was raised with a combination of ticket sales, personal donation, silent auction, and live auction items. It was a complete success! 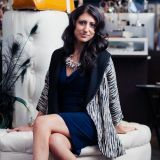 Tannya is best known for her style expertise and personal shopping skills. She can easily combine texture, styles, and trends to produce an effortlessly pulled together look. Clients appreciate her ability to understand and interpret their creative vision yet stay true to her personal aesthetic. © 2018 Ville Magazine. All Rights Reserved.